... or real life imitates food magazines. As you know, I recently had company. Company means buying a lot of groceries, as I would never want a guest to go hungry! Guests, knowing this trait before they arrive, love to bring groceries. Then the guests leave and always (as there are really only 4 or 5 meals that one can possibly work into a day), there are tons of groceries left over. Canned goods, lovely pots and jars of accouterments, beans and peas and pasta can live to see another day. Meat can be frozen, but produce presents a problem. There is never enough produce to make confiture, however, there is too much to be consumed before it goes bad, so there is a lot of juicing and saucing that goes on. Case in point. Ann brought a box of organic, still on the vine tomatoes AND she brought some loose tomatoes. Ann likes to shop at several different places and often forgets what she has bought. The other day I said I was cooking the rest of the tomatoes and Ann said, "but you used tomatoes in the salad!" Well, yes I did. But in order to eat all the tomatoes Ann brought, I would have needed to make salad for 100. One thing Ann always brings is my favorite mozzarella balls from Wegman's. They make these tiny mozzarella balls just slightly larger than English peas. I stuff meat balls with them and make bite-sized (OK, two bite) Caprese salads. I dredge the tiny balls in balsamic, olive oil, and tiny basil leaves. Then I spoon the mixture into cored tomatoes. A touch of salt and you are good to go. After the mozzarella balls ran out, and pasta sauce was made, and more salad... there were still tomatoes. The rest of the leftover tomatoes I roasted with some garlic and olive oil. I baked some bread and ate a couple and the rest I tucked away for a future sauce! 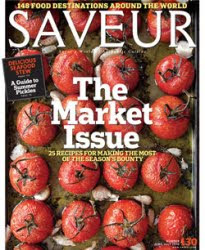 So imagine my surprise when two days later I received my copy of Saveur. There were my roasted tomatoes on the cover. 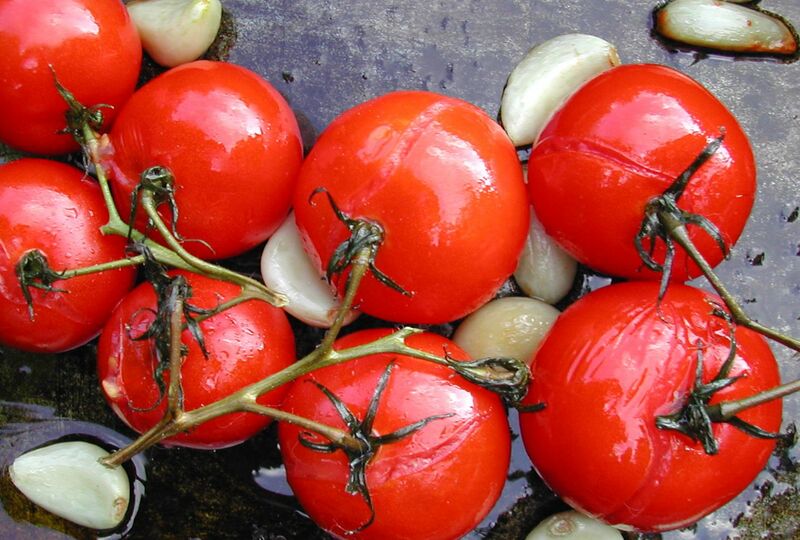 If you desperately need to know how make roasted tomatoes and lean toward the scientific, here's the Saveur recipe. 1. Heat oven to 425°. 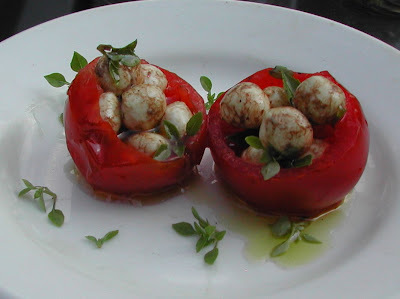 Place tomatoes, garlic, and thyme on a rimmed baking sheet and drizzle with oil; season with salt and pepper. Bake, brushing tomatoes occasionally with the oil, until tomatoes soften and their skins split, about 25 minutes. 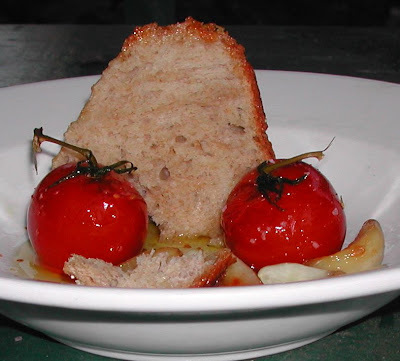 2.Transfer tomatoes, along with juices, to a serving dish and serve warm with crusty bread. If you come to Lucindaville, it will only serve 3 as you will need to keep up your strength for Supper. When I have too much produce or meat to cook, I try and cut it up and freeze it, rather than keeping it until it starts to go bad, and I have to throw it out. I store the vegetables in "catch all" zip lock bags that I keeping adding to, and use to make stock when achieving a critical mass.